Federal MPs from all parties met in Ottawa this morning with Canadian Men’s Health Foundation Chariman Dr. Goldenberg, President Wayne Hartrick and Olympic gold medal winner Adam Kreek to launch the second Men’s Health Caucus. 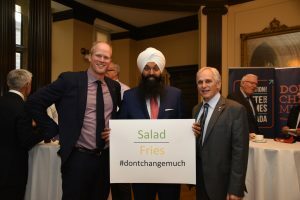 The Men’s Health Caucus is an informal network of federal MPs from all parties supporting men’s health and family wellbeing, and this first meeting was organized by MP Randeep Sarai from Surrey Centre. MPs receive updates from Canadian Men’s Health Foundation on men’s health issues and will promote the dontchangemuch.ca website and youcheck.ca to their constituents. Canadian Men’s Health Foundation also acts as an information source for the MPs.